Chelsea boss Jose Mourinho should apologise to team doctor Eva Carneiro for "publicly humiliating" her, says Liverpool's former head of medicine. Peter Brukner, now the Australia cricket team's doctor, said Mourinho's criticism was "100% wrong" and Carneiro should not have her role changed. Carneiro, 41, treated Eden Hazard after he was tripped in the final minutes of Chelsea's 2-2 draw with Swansea. It briefly left the Blues with nine men after Thibaut Courtois's red card. Carneiro looks set to lose her place on the bench for Sunday's Premier League match against Manchester City after Mourinho described his medical staff as "impulsive and naive", adding they did not "understand the game". 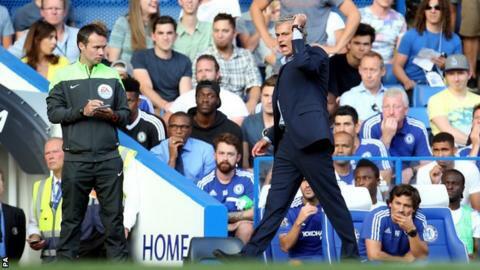 Speaking to BBC Radio 5 live, Brukner said Mourinho had "shown a significant lack of respect". The Australian said Carneiro and physio Jon Fearn acted "correctly" by waiting for referee Michael Oliver to wave them on to treat Hazard, who he claimed should be "copping it" if he was not injured. "It's got nothing to do with the manager," said Brukner, Liverpool's former head of sports medicine and sports science. "You don't have doctors telling a manager to play someone up front or play 4-3-3. "The doctor was 100% correct and the manager, in my opinion, was 100% wrong. "He should apologise and the club should ensure that the doctor and physio are not demoted as a result of this. "She has been publicly humiliated in front of the biggest audience there is and she had not done the wrong thing." Eamonn Salmon, chief executive of the Football Medical Association (FMA) - which represents professional medical staff in the sport, also backed Carneiro and Fearn. "On reflection, the majority of people would consider that the medical staff did nothing wrong," Salmon, a former Manchester City physio, told BBC Radio 5 live. "I have seen these sort of things happen, the physio going on at the wrong time and the manager not happy with them. In the heat of the moment you get it, I am just slightly surprised he has come out post-match." "They conducted themselves with integrity and professionalism - that is their job. "We feel that she has been treated harshly." Carneiro will no longer attend matches or training sessions but will continue to work with first-team players at Chelsea's Cobham training ground, according to the Daily Telegraph. The Premier League Doctors' Group said removing Carneiro from the bench would be "unjust in the extreme". The group, drawn from top-flight clubs, said she had "universal and total support" from her medical colleagues. It added: "A refusal to run onto the pitch would have breached the duty of care required of the medical team to their patient. "The precedent set by this incident demonstrates that the medical care of players appears to be secondary to the result of the game." But former Blues winger Pat Nevin said the decision to treat Hazard was "probably a slight error of judgement", though he added it was "not the worst one in the world". Nevin said he was "saddened" by the disagreement, but added it was not "particularly uncommon" in football. "Last season, Jose Mourinho said he was so proud of his medical staff and how hard they worked to keep players fit for so long. "We have kind of forgotten the fact he was quite fulsome of his praise to those people."